Preheat oven to 170°. Line two baking sheets with silicone baking mats. Core and peal apples. Cut into large chunks. Toss in lemon juice to avoid browning while prepping remaining apples. Add apples and remaining ingredients to a large saucepan or stock pot. Cook over medium heat. When apples are tender, use a potato masher to slightly mash the apples. Continue cooking for an additional 5 minutes. Carefully pour mixture into blender or food processor to puree. Divide puree evenly between pans. Use an offset spatula to smooth out the mixture. Bake for 3 hours or until leather is slightly tacky and no longer wet. Time will vary depending on the thickness of your mixture. Every hour, rotate pans 180° and swap rack levels. Allow leather to cool before slicing. Using a pizza wheel or knife, carefully slice fruit leather into size desired. Wrap in wax paper. Store in airtight container. * Boiled cider may be omitted from recipe if you do not have it. Alternately you may use apple cider or apple juice in place of the boiled cider and water. Spread crescent rolls over round pizza pan. Mix the flour, cinnamon and sugar and add chopped apples. Layer the apple mixture over the crescent rolls. Next, sprinkle cheese over the top. Heat olive oil in large skillet over medium heat. Once hot, add cabbage, carrots and chestnuts to pan and cook, stirring frequently for 4-5 minutes, until vegetables just begin to wilt but still remain a little bit crisp. Mix the cornstarch w/water thoroughly. Add mixture and soy sauce to pan along with green onions. Cook for additional 1-2 minutes or til sauce thickens. Remove from heat and let cool. Place 2 Tbsp of mixture on center of egg roll wrap. Fold bottom up over filling. Next fold the two sides over, making it look like an envelope, then roll it up like a burrito. Preheat oven to 400°. Spray baking sheet w/cooking spray. Place rolls on baking sheet – spray top of rolls w/cooking spray. Bake for 8 – 10 minutes then turn them over. Bake for 5 – 7 minutes or til crispy and golden brown. Put cereal in large bowl. Melt together chips and peanut butter and pour over cereal. Mix well. Put powdered sugar in large baggies. I put 3/4 cup in each of 2 baggies. Put cereal mixture in and shake to coat. Mix everything. Spread on baking sheet into 8 x 12 rectangle. Bake 325° for 20 minutes or until edges are toasted brown. Cut into bars while still hot, but don’t move them yet. Let cool in pan. Separate once cool. Store in airtight container at room temp for up to 1 week. In a large bowl, stir together quick cooking oats and crispy rice cereal. Set aside. In a heatproof bowl or Pyrex measuring cup, stir together butter, honey and brown sugar. Microwave until it starts boiling (about 2 minutes with my low-wattage microwave, could be sooner for you). Once it begins to boil, let boil for 1 more minute in the microwave. Remove from microwave and stir in peanut butter and vanilla until smooth. Pour hot honey mixture over dry ingredients and mix until thoroughly combined. Pour into a lightly greased 8×8 pan and let sit at room temperature for about 2 hours or in the refrigerator for a half hour or until set. 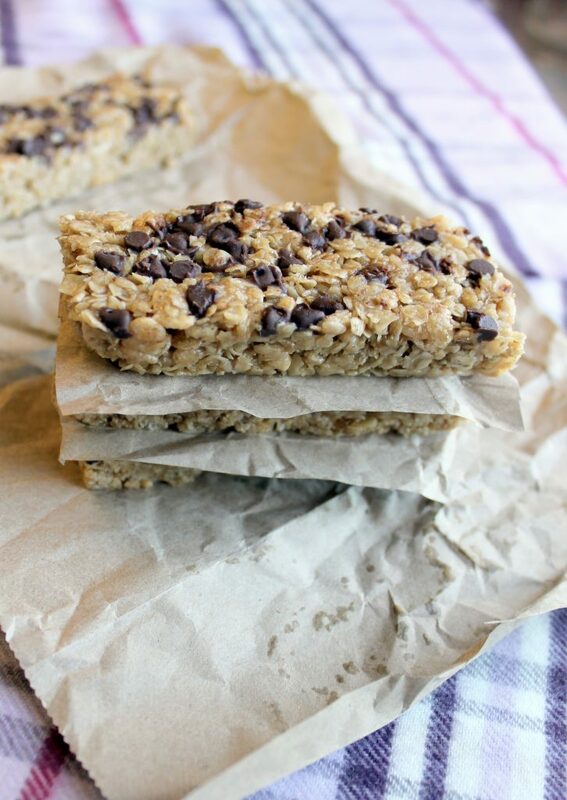 Cut into 10 bars and store tightly wrapped in plastic wrap or in a tupperware. Melt together peanut butter chips and shortening. Immediately stir in chow mein noodles. Drop by heaping teaspoons onto prepared tray. Brown ground meat in medium fry pan. Drain off excess fat. In fry pan, add taco mix and refried beans. Mix well. Spread mixture into 9 x 13 pan. Spread sour cream over top. Spread taco sauce over top. Sprinkle shredded cheese over top. Bake at 350° for at least 30 minutes or until cheese has melted. Serve with taco chips. Mix together egg, ricotta, lemon zest, 1/2 tsp salt, 1/8 tsp. black pepper, and red pepper in a bowl until smooth. Arrange bread slices on a baking sheet. Brush with 1 Tbsp. oil, then toast in oven 3 to 4 minutes. Remove from oven and let cool slightly, about 2 minutes. Spread cheese mixture evenly over bread slices. Bake until cheese is browned, about 15 minutes. Meanwhile, heat 1 Tbsp. butter and remaining tablespoon oil in a very large skillet over medium-high heat. Add mushrooms and cook, stirring occasionally, until browned, about 10 minutes. Add green onions; cook and stir until softened, 2 to 3 minutes. Remove from heat and stir in wine. Reduce heat to medium-low and return skillet to heat. Stir in broth, lemon juice, and remaining tablespoon butter. Cook until liquid has evaporated, about 5 minutes. Stir in parsley. Season with additional salt and black pepper to taste. Spoon mushroom mixture over bread slices. Serve warm. Stir together all ingredients in a 1 1/2-quart baking dish. Preheat oven to 350°. Line a baking sheet with foil; lightly coat with cooking spray. Lay pastry onto prepared baking sheet and spread jam evenly over center. Sprinkle with walnuts. Fold sides of pastry over Brie. Turn over, sealed side down, and seal any open edges. (Instead of turning it over, you can cut the edges of the pastry into strips and fold them over each other to create this look.) If using egg wash, whisk together egg and water, then brush over pastry. Bake until golden brown, about 30 minutes. Let stand 5 to 10 minutes. Preheat oven to 425°. Spray a large baking sheet with cooking spray. Stir together water, butter, and salt in a saucepan; bring to a simmer over medium-high heat. Reduce heat to medium; whisk in flour and stir vigorously until a pastelike dough forms, 2 to 3 minutes. Transfer to a bowl to cool until warm, 5 to 10 minutes. Beat in 1 egg, thyme, and pepper into cooled dough with a wooden spoon until egg is completely incorporated. Add remaining egg and beat until completely incorporated. Set aside 2 Tbsp. cheese. Stir remaining cheese into dough until combined. Scoop 1-inch balls (2 tsp.) of dough and set 2 inches apart onto prepared baking sheet. Top balls with reserved cheese. If they deflate, it means they were taken out of the oven a little too soon. Turn the oven off, turn them over, and leave for five minutes. Variation: Chives and Gruyere cheese.